The opening moments of A Star Is Born depicts Bradley Cooper walking onstage to a cheering crowd, a fitting image for him, not only the film’s lead actor but also director and co-writer. All eyes are on him, everyone asking the same question: what can he do to breathe fresh life into the fifth adaption of this story since 1937? He’s barely walked to the microphone before jumping right into the first song, and the crowd is in love. Any doubts about whether he’ll be able to pull this off are instantly vanquished. And the best part? He doesn’t even look like he’s trying. That’s A Star Is Born in a nutshell. Cooper makes a film with such confidence you’d swear he’s been at it for years, despite this being his first time behind the camera. While the story remains close to previous versions, Cooper modernises the formula while still retaining the emotional centre that is the romance, filtered through a rather cynical viewpoint on fame, money and the music industry in general. It serves as a reminder that some stories, no matter how many times they’re told, never lose their impact. 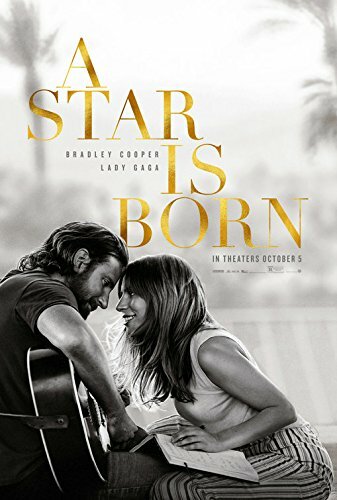 Cooper and Lady Gaga make for a tremendous duo, the former playing the hard-drinking singer Jackson, and the latter as the young singer Ally he falls in love with. Gaga has been the focus of much attention recently, already tipped as a future Oscar winner, and while she’ll face tough competition, it would be a deserving win. For want of a better phrase, a star is born here, giving a very naturalistic performance and easily holding her own amongst the seasoned actors she shares the screen with. No doubt Cooper agrees, displaying the film’s title over the first shot of Gaga singing. The rest of the cast give strong performances, with particular mention to Sam Elliott as Jackson’s older brother, Bobby. The standout scene, when Cooper and Gaga sing Shallow, performing to a crowd of thousands, is one of the greatest scenes in the history of this genre. Cooper and Gaga’s singing abilities are unleashed to their full effect, and it is a remarkable sight. Cooper and DP Matthew Libatique shoot the scene in stark contrast to most musicals, favouring close-ups and tight framing rather than grand wide shots, keeping with our actors for the entire scene. You feel like you’re on stage with them. The final scene displays Cooper’s skills as a director perfectly. He uses one of the basic forms of editing, a hard cut, to such powerful effect it makes me jealous it’ll be a few years, minimum, before he releases another film. I won’t spoil it, but you’ll know it when it happens, and it’ll break your heart when it does. It’s not flawless. The second half suffers from some pacing issues and Gaga’s character lacks development in areas. The theme of her selling out after becoming famous, changing from personal ballads to generic pop songs, is criminally underdeveloped. We never learn her perspective on this; is she happy doing this type of music or does she hate that she’s become the safe, predicable popstar she was previously fighting against? So, it’s not perfect, but what is, and the fact Cooper managed to get so much right in his directorial debut is truly remarkable. With both lead actors delivering career-defining performances, and some of the best musical sequences ever put to screen, A Star Is Born is unquestionably one of the best films of the year, and the best musical since 2000’s Dancer in the Dark.